Leave it – Teach your dog to NOT eat stuff. The “Leave It” is useful when you want your pup to avoid going near something or picking up something. Like for instance that vitamin you dropped on the floor, or the duck poop at the park, or that sandwich on the coffee table. “Leave it” means don’t go near it please. Once it’s in the dog’s mouth, then it’s a “drop” or “give”. If you follow the steps below, I guarantee you will have a “Leave it” taught relatively quickly. 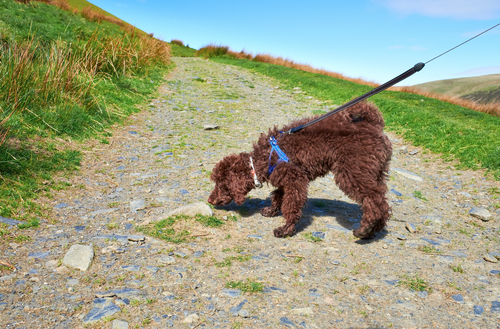 The tough part is getting your dog to leave stuff he really, really loves, especially on your walks. So practicing this daily, and reinforcing the behavior will get you a rock solid “Leave it”. If your dog leaves things and you don’t reward him, the behavior will end. Remember, behaviors that are rewarded will occur again, proven science. And also eating duck poop is very rewarding, so you have to replace that reward in order to win. YES – what is the significance of using this word? It’s a marker word. It marks the exact moment that the dog got it right and it says “YES” that’s what I wanted and you have a treat coming. It’s a communication tool. If you use a clicker, this is the same as that, use your clicker instead of the yes. You can pick another word, but I don’t suggest good or other words that you use in your language with your dog. Put together a mix of some really yummy, small treats. I make my own trail mix of different treats and usually include a high end kibble in there. This way the dog does not get tired of the same treat. It helps to have a treat bag on you, or put the treats on a counter so that you can resupply quickly as needed. Treats in both hands. Your left hand goes behind your back. Extend your right hand out and show your dog a treat in the palm of your right hand and as soon as he moves towards the hand make a fist on the treat. As soon as he stops licking, pawing, nosing your and mark it with saying “YES” and give him the treat in your left hand NOT the one in your right hand. Repeat until your dog will sit and look at you and stop trying to get at the treat. Say YES and deliver a treat when he does this. Good job, take a break. Present your right hand with a treat in your fist and say “Leave it”. When he looks at you, “YES” and reward with the left hand treat. Do this 5 times. Take a minute or two break. Play with your dog for a moment. Place a treat on a short table or a chair and say “Leave it” (be ready to cover them with your hand if he makes a move for them). When he looks at you instead of trying to get the treat, again “YES” and give him the high value treat. Move the treat on the chair just a little and repeat. Practice 5 times, and then take a break. Next we will place the treat on the floor. But first leash your dog. If you have 2 people, have one hold the leash. If you are alone, tether your dog so he will not be able to get to the treat. The leash is insurance! TIP: Every time you practice with putting the treat on the floor. PICK UP THE TREAT! Do not let the dog just eat the treat on the floor, because in real life, a “Leave it” is just that. Now place a treat on the floor, say “Leave It”. Be ready with your foot to cover the treat if he goes for it. As soon as he looks away from the treat or looks at you, YES and treat. Pick up the treat and move it to a different location a foot away from the last spot. Repeat 5 times. When he starts staring at you every time, make the game a little harder. Try in different places in that room. Move to another room. Try unleashed. Try with real world things, like dropping something from the kitchen. Practice with socks, toys or other items in your house that he thinks is valuable. Practice dropping a vitamin like a fish oil (if he gets it no problem). Keep making the game a little harder; go to a place with mild distractions like the back yard or the park with you dropping a treat. If you are having success, now try with real world things that you need a “leave it”on a walk. The most important path to success is to make a huge happy fuss when your dog leaves something that he loves in the outdoors. Have a huge party and give him several treats. Repeat this several times, so he really gets it. When you see that your dog really has learned this, then you can start to reward intermittently, reward the really good fast ones, the ones that you know are hard for him. Leave It, if a dog is too involved in a sniff. In order to keep a good “Leave It” tuned up, reward a few each week, and then you will be able to keep your dog safe from eating a lot of icky junk in the world. When your dog is really good at leaving things, you can use it to “don’t go towards that dog”. “Don’t make a move towards that cat”. Reward all of these at first, then move to intermittent rewards. Remember this, “Leave it” only works when you are there. Just because you said “Leave it” with the meat on the counter, doesn’t meant that’s going to work when you leave the room. It might for some dogs, but not for others. Especially when you have a young dog that is learning, be diligent so you don’t have too many surprises. When you say “leave it”, don’t yell, scream, or get nasty with the words. It’s just calmly, in a monotone voice, “leave it”. I do not suggest letting the dog have the treat you put on the ground. Why you ask? Because in real world situations, you don’t usually say leave it to the horse poop, then say okay now eat as much as you want. I find the things you want your dog to leave are always a “leave it”. If you want to make a game of leaving a treat on the floor and letting your dog wait, then get it. I would call that “wait”, another excellent behavior to train your dog. I hope you have success, let me know how you do? Another good tip. Thank you. I love everything about your blog! This is a great theme and an especially helpful post. “Leave it” is definitely one of the most useful things I’ve taught my dogs. They also know “Wait.” Instead of “Yes,” my dogs know “Okay!” as a release command, which is super important. Thanks for reading. Sounds like you’ve got your dog’s trained up well. Happy adventures to you and your pups. Hey Jeanne, I love your blog and writing style. Yes, dogs are smart, but they are like little kids just a little bit, they do need direction to live in our world. I think I actually initially trained this the wrong way. But somewhere along the line I learned the correct way, and it’s something we practice daily. At first it didn’t work with things that Luke really loved – oddly, tissues! – but we are making progress and he’ll even give those up now. It also works for us when he’s barking at people outside, or bothering his sisters. I think it’s really one of the best commands! It’s so valuable Jan. Rewarding a lot in the begging, then tappering off will get you the behavior you want. then just once in a while reward the “leave it” to keep it tuned up. Excellent advice! I used to dog sit regularly and it always astonished me how few people take the time to train their dogs in even the most basic respects. So true, I used to dog sit also. thanks for stopping by. We play the “wait” game when we feed the dogs but I need to re-train leave it – honestly, someone in the housr dropped an Alleve tablet about a week ago and I freaked out. I found it before the dogs did but I thought about whether they would leave it if asked… it worries me. Thanks for these tips! I love the “wait game” too, it’s so valuable. The “leave it” is so useful also for a dropped pill or another dog. Thanks for stopping by. Thank you for joining the Pet Blogger Showcase. We find the Leave It command to be very important, especially because there is someone in our pack (Delilah) who will scarf just about anything down. I have a friend with a new puppy and she was just asking about Leave It, so I shared this with her also! Hey Jodi, I too have been using the leave it a lot here on the Oregon Coast. It usually applies to “don’t go towards that”, meaning Hey Mick, please don’t go up to that family on the beach and pee on their sand castle! I’ve been reinforcing a lot and now I’m feeling much more comfortable in busier settings. Hey Tails Around the Ranch. Always remember, behaviors that are rewarded, will occur again. This is plain, proven science. For us too! So behaviors that are not rewarded will most likely fade away. Thanks for coming and reading! Always fun!